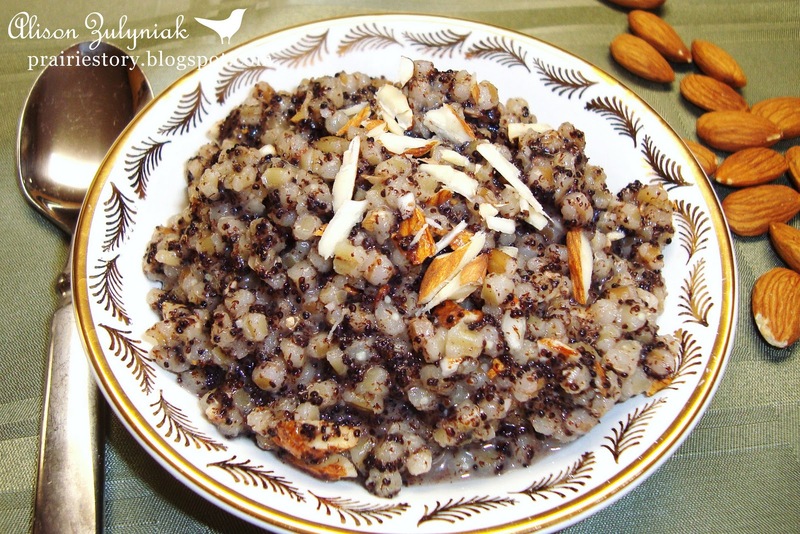 Kutia, otherwise known as Wheat with Poppy Seeds and Honey, is part of our traditional Polish twelve course, meatless meal on Christmas Eve called Wigilia. Kutia is usually classified as a Polish dessert, however my family would serve it as one of the first courses as an appetizer. As a young child I remember my older cousins going crazy for Kutia at Christmas and it was a treat for the adults too. I have grown to quite like it as well! I also remember hearing how it is customary for the Kutia to be thrown on the ceiling - if it sticks, then it will be a good year, and the more kernels that stick the better your good fortune will be. The origin of this dish dates back some 5000 years when the Ukrainian people first cultivated wheat. The wheat celebrates the staff of life, the honey represents the spirit of Christ and the poppy seeds represent abundance and prosperity. - Soak wheat overnight in cold water. - Rinse, then cook until there are no hard kernels. Keep boiling and keep adding water. Drain, rinse and cool. - Scald the poppy seeds with boiling water then cook 20 minutes until puffy. Drain and cool. - Put poppy seeds in blender to turn milky. - Make honey mixture by heating honey, water and sugar until sugar is dissolved. - Mix wheat, poppy seeds and honey mixture together. Add almonds. - Serve cold or at room temperature. We have Kutia as our first "appetizer" on Christmas Eve as well! Our recipes are similar. We will be blogging ours in a few days. I've never heard about throwing it up to the ceiling before!